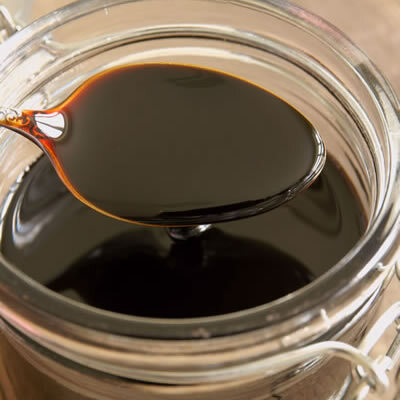 Molasses functions to add moisture to baked goods, as well as lengthen the shelf life and inhibit rancidity. Extremely viscous, syrup-like by-product of the sugar refining industry derived from the sugarcane or sugar beet. In Portugal, the first printed book containing information on molasses dates back to the 1500’s. However, molasses was first imported into the United States to make rum. Sugarcane molasses is processed first by stripping the sugarcane plant, then via pressure by force extracting the plant’s sweet juice. Sugar crystallization is promoted by boiling the extracted liquid to create the syrup. Molasses functions to add moisture to baked items, as well as lengthen the shelf life and inhibit rancidity. Products containing molasses have a distinct brown sugar flavor denoted by the intense, slightly sweet and slightly bitter taste of the molasses. In the baking industry, cane molasses is a major ingredient found in dark corn syrup, brown sugar, and maple syrup. Light molasses is the preferred variety of molasses, though all varieties are interchangeable. Generally, fancy or light molasses is more desirable than the alternative ‘more robust’ varieties because of the sweeter taste. Dark molasses varieties are associated with greater bitterness. Molasses crinkles, ginger snaps, and gingerbread are three of the more popular cookies utilizing molasses.